After a one-year hiatus, Guelph Reads!, sponsored by the Friends of the Guelph Public Library, returned to the main Library on February 27 and was greeted by a substantial, supportive audience despite the stormy weather. Moderated by Anne Mackay, the panel of prominent Guelph citizens included Guelph Symphony conductor, Judith Yan; recent local politician Aggie Mlynarz; and Rev. John Borthwick, the minister of St. Andrew’s Church. They supported, respectively, Washington Black by Esi Edugyan, Split Tooth by Tanya Tagaq, and Seven Fallen Feathers by Tanya Talaga. All three panel members agreed that all three books are outstanding and should be on everyone’s ‘must read’ list; and in a first for Guelph Reads! the audience vote resulted in a tie for ‘first read’ between Split Tooth and Seven Fallen Feathers. 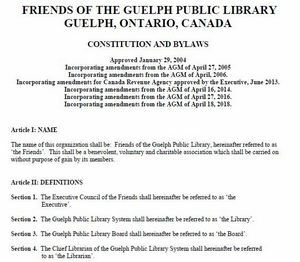 Would you like to be a real friend of the Guelph Public Library? Become a Program Volunteer! Attend Guelph Public Library programs and give the staff a hand. This new volunteer opportunity is open exclusively to members of the Friends of the Guelph Public Library. For more information about how to get involved visit our Program Volunteer page. If you missed the workshops on January 15, but would still like to give some feedback about the vision and mission of the Baker District redevelopment project, workshop content will be online at haveyoursay.guelph.ca by January 21. The Baker District redevelopment is a City of Guelph project aimed at transforming the existing parking lot and properties fronting the north end of Wyndham Street into a unique mixed-use development, including a new central Guelph Public Library. The Downtown Secondary Plan envisions the district becoming a model of urban intensification that drives visitors to the downtown and encourages business to thrive within its boundaries by combining residential and commercial/institutional spaces. The project also includes public parking and an urban square. To learn more about the Baker District redevelopment project, visit guelph.ca/bakerdistrict or to participate in engagement activities, visit haveyoursay.guelph.ca. …To our dedicated volunteers, nearly 200 of them! Thank you for another successful sale – $118,000 raised this year. Wow! Another great year for the book sale. Over $118,000 raised this year to bring our grand total raised to date to over $745,000! Way to go Guelph! Thanks for your continuing support. See you next year…..
Answer this year’s feedback questionnaire, and you will be eligible to win this gift basket (value $50) donated by Market Fresh, Guelph. Thank you Market Fresh for supporting the book sale with this tasty donation!